Combining permanent and portable electric fences to create an electric fence grid for your pasture rotation is the most efficient, most flexible, and most cost-effective way to manage your rotational grazing program. In Part I and II of this Smart Electric Fence Grid article series I explained how to set up the broad permanent electric fence corridors that provide the skeleton-structure of your Smart Electric Fence Grid. The next step is to use portable electric fences (i.e. poly tape or poly wire) to subdivide these permanent pasture fence corridors into daily grazing slices. On this page you will learn how to use temporary portable electric fences in your permanent electric fence grid to create simple cost-effective pasture subdivisions for your daily pasture rotation, without cluttering up your farm with a maze of fences! I'll show you how to create a simple daily grazing routine that makes portable electric cross-fencing ideal for managing your rotational grazing program. I will also show you how to pre-plan your daily pasture rotation on paper to create a seamless 'flow' around your entire farm. In Part IV I will share a bunch of portable electric fence construction tips - about the wire, portable posts, power connections, and geared reels - to make your portable electric fences as simple and easy as possible. Use the links below to review previous steps in the Electric Fence Planning and Installation process. Portable electric fences are the perfect tool for creating cross-fences in your permanent electric fence corridors in order to divide your pastures into daily grazing slices. Creating daily grazing slices in your rotational grazing program does not mean that you need to subdivide your pastures into hundreds of tiny paddocks. Quite the contrary, actually. You only need three short lengths of portable electric fencing to create a continuous pasture rotation around your entire farm! The basic layout is shown in the diagram below. 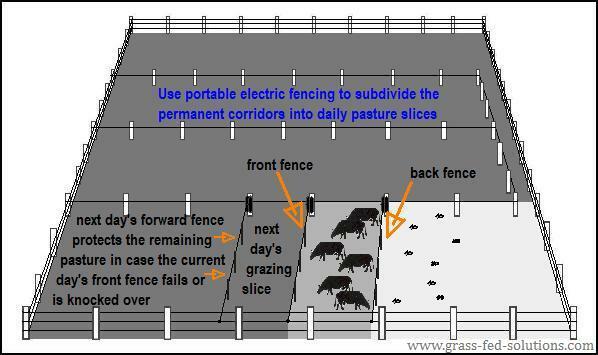 Step # 3: Use portable electric fences to cross-fence your permanent fence corridors to create daily grazing slices. A front fence and a back fence contain your grazing herd within their current grazing slice. You also always setup the front fence for the next day's grazing slice one day in advance in case your herd knocks over the front fence in its current grazing slice. This second front fence acts as your insurance policy to prevent your cattle spoiling more than a single day's worth of grazing if their current front fence fails. Since the back fence only leads to the area that's already been grazed, there is no need for a second back fence. How big or how small you make each of these pasture slices will vary throughout the year. During the summer they will shrink or grow depending on how quickly you need your herd to cycle through their entire pasture rotation in order to prevent your grass from going to seed. As I explained in the article about the daily pasture rotation, this means that your cattle will not completely use up all the grass in each pasture slice before moving on to the next slice. Sometimes you will allow your cattle to graze as short as a 6 to 10 inch stubble while at other times your pasture rotation will need to move so quickly to keep your grass from going to seed that your cattle will only be top-grazing your pastures very lightly before moving on to the next grazing slice. Once the growing season ends your rotational grazing strategy will change. Pasture slices will be used to ration out the remaining grass reserve so that your cattle use up each pasture slice completely before moving on to the next. Follow the link to learn more about rotational grazing strategies for both summer and winter grazing. Every morning you use the insulated handle to open a temporary gate in the front fence to allow your cattle into the next grazing slice. They essentially move themselves - you may even want to walk in front of them to slow the mad dash to the fresh grass. It's the perfect time to do a quick herd health check as the herd moves through the temporary gate. Yesterday's front fence becomes today's back fence. Roll up the previous back fence on your geared spool and collect the portable step-in posts. You can even collect them at the same time as you roll up the wire if you wear a quiver to hold your posts. Page 77 of Grass-Fed Cattle provides instructions for building your own quiver to hold your portable electric fence posts during pasture moves. You can see the geared spool and post quiver in action during a pasture move in the image below. Set up this same section of wire and posts as the front fence for tomorrow's grazing slice. And then you're done! You only move a single short section of portable electric fence every day. Your new section of portable fence is powered by drawing electricity from the permanent electric fence grid. You simply hang the geared spool off of the 12.5-gauge permanent electric fence wire on one side of your big fence corridors discussed in Part I and connect the portable poly-wire to the 12.5-gauge high-tensile wire using a little alligator connector-clip. It's that easy. If you use a mobile mineral feeder to accompany your cattle (highly recommended), pull your mineral feeder into the next pasture slice at the same time as you move your cattle. I like to drag the mineral feeder behind the ATV during the pasture move as a 'follow-me' cue and to prevent the excitement of cattle running headlong through the open gate. This allows you to control how quickly the cattle move to the next pasture. Grandma's walking pace is perfect for keeping your cattle calm and ensuring that no newborn calves get left behind in the excitement. Using the mineral feeder as a 'follow-me' cue also prevents the cattle from mobbing the ATV if it comes to the pasture at other times of the day since the cattle learn to associate the mineral feeder and not the ATV with their pasture moves. 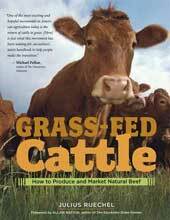 You can learn more about using 'follow-me' cues and other low-stress cattle handling strategies in the "Managing Your Herd" and the "Electric Fences and Rotational Grazing" chapters of Grass-Fed Cattle. 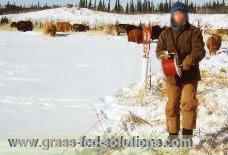 Moving a portable electric cross-fence during winter grazing. Follow the link to learn more about winter grazing strategies. You may also need to move your water tub depending on how you design your cattle water system to integrate with your electric fencing system. If you use a mobile water tub, I like to pull the plug out of the tub prior to the pasture move so the tub can drain while the cattle are being moved. By the time the new fence is set up the tub is empty and can easily be slid a few feet further down the pasture by hand to the next water hookup, or it can be moved on your ATV trailer if you are using very large pasture slices. 10 to 15 minutes after the pasture move the cattle already have water so the cattle don't ever perceive a temporary water shortage that could cause them to panic and all mob the water tub at once. Cattle water is discussed further in Part V of this article and in the Livestock Water section of this website. In the diagram below you will notice that the cattle have advanced to the next day's grazing slice, which only required a single portable fence to be moved. DO NOT draw all your daily grazing 'slices' onto your grazing map since the size and location of your pasture slices will vary throughout the year as your grass growth rates change or as you vary your herd's grazing impact on your pastures for a wide range of pasture management applications. Rather than showing individual pasture slices, simply use a series of arrows to indicate how you intend to cycle your cattle through the entire pasture rotation. The last arrow you draw needs to connect back to the tail end of the first to complete the rotation, as is shown in the schematic below. Plan the flow of the herd migration through your corridors. This will be your summer rotational grazing strategy and should be planned as a separate transparent map overlay on your base farm map. 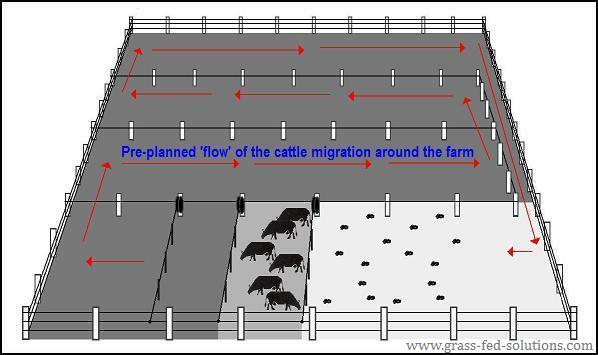 Your permanent fence corridors must be laid out so you can create a seamless 'flow' of cattle around your farm without creating long and complicated cattle moves to reach the next pasture slice. Drawing the plan for your daily pasture rotation in this way allows you to plan all your gates for stress-free and simple pasture moves. 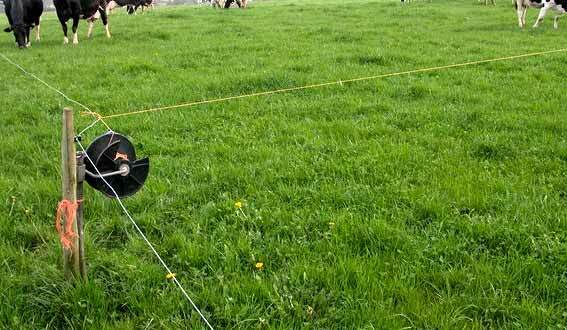 It becomes a grazing blueprint that anyone can follow to manage your pasture rotation for you. Pre-planning the flow of your pasture rotation on paper makes it much simpler to plan your cattle water system, which is the topic of Part V of this article series. Pre-planning your pasture rotation also lets you 'see' in advance how you might need to manipulate your pasture rotation to set aside specific areas for calving, weaning, breeding, or grass-finishing, all of which should be planned separately on their own transparent map overlays in your farm plan. Part V - integrating cattle water into your electric fence installation. Part VI - electric fencing and cattle water in winter. Example pasture rotation and farm plan - Farm maps with a step-by-step explanation of electric fence layout and grazing strategy. Tips for drawing your cattle management farm plan - Handy tips on how to plan your electric fence installation and grazing strategies using map layers. Dealing with existing cattle fences - Electric fence planning advice for farmers with pre-established infrastructure.